The first Italian-made Jeep product. Made in Italy: 2015 Jeep Renegade. If you are looking for a small SUV, the 2015 Jeep Renegade intends to meet that need. Introduced this week just before the start of the 2014 Geneva Motor Show, the latest model from this iconic brand also represents the most recent product jointly developed by Fiat and Chrysler, automakers that have since merged to become Fiat Chrysler Automobiles, N.V. or FCA. Jeep is a wholly-owned brand of FCA. The all-new Jeep Renegade advances a look that is at once timeless as it is modern. Its fascia, particularly the round headlamps that flank its seven vertical slot grille, is all Jeep. Its tail lamps detail an X design, while its interior is wholly modern with many tech features included. 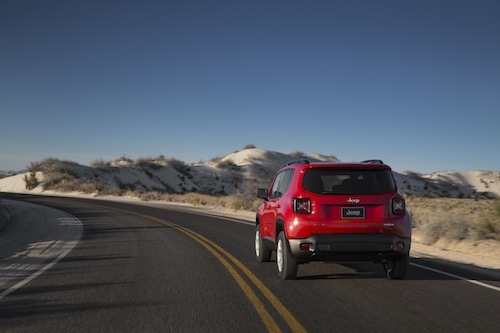 As with all Jeep models except for the Wrangler, the Renegade is car-based (unibody construction). 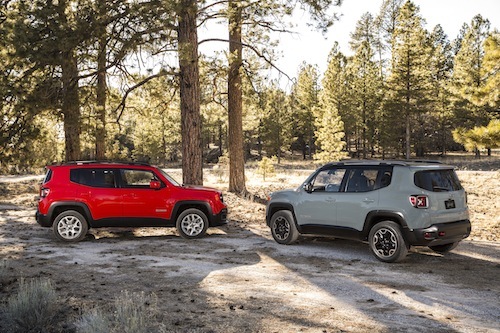 Like other Jeep models, select editions such as the Renegade Trailhawk will be trail rated. Thats a designation for Jeep 4×4 models that perform in five categories of off-road conditions: articulation, ground clearance, maneuverability, traction, and water fording. The traction this model experiences off-road is proportionate to what is experienced on asphalt. Jeep says that the Renegades two 4×4 systems are based on the technology found in the Cherokee, an all-new model introduced this year. Jeep claims that the Renegade will deliver best-in-class off-road capability, providing 100 percent of the available torque through any wheel to the ground for excellent grip. Both 4x4s are full-time systems; one offers a 20:1 crawl ratio. Notably, the Renegade will be the first small SUV featuring a disconnecting rear axle and a power take-off unit, what will enable this Jeep to claim higher fuel efficiency numbers. Both systems will come equipped with a Jeep Selec-Terrain system with five driving modes: auto, snow, sand, mud, and rock, the latter exclusive to the Trailhawk edition. FCA has been pushing the Jeep brand hard in the United States and abroad. To that end it is offering a whopping 16 powertrain combinations to meet projected demand and to serve local markets. Not all combinations will be available in the same market, what will include four gasoline, two diesel, and a flex-fuel engine. Manual and dual-dry clutch transmissions, and the segment’s first nine-speed automatic transmission will also be available. Additional fuel savings will be realized from start/stop technology. Jeep is making a big deal about the Renegades technological features pointing out that it will offer a range of communication, navigation, and entertainment features that were at one time available only with high-end SUVs. Some features are standard while others are part of upgrade packages. 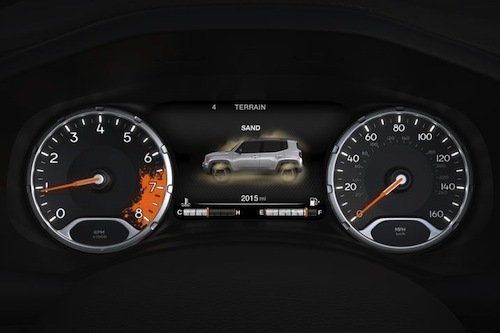 No matter, the 2015 Jeep Renegade will offer on-demand Wi-Fi hot-spot capability, UConnect Access including 911 service, voice texting, Yelp search, and a mobile app service that allows the owner to start the vehicle remotely. The Renegade comes with 5.0- or 6.5-inch touchscreen systems, Bluetooth connectivity, a USB port, an auxiliary jack, HD Radio, SiriusXM satellite radio with Travel Link, and a full-color instrument cluster display. The Jeep Renegade will sit on a 101.2-inch wheelbase and measure 166.6 inches long. That’s not too far off from the 103.7-inch wheelbase and 173.8-inch length for the Jeep Patriot, a product that Jeep intends to keep in production for now. The Renegade also measures 71 inches wide by 66.5 inches tall. The all-important ground clearance numbers are 6.7 inches for the 42 and 7.9 inches for the 4×4. Choose the Trailhawk 4×4 and you get 8.7 inches of clearance, matching the Subaru XV Crosstrek Hybrid, for instance. And towing is a possibility too with the Renegade rated from 1,000 to 3,300 pounds, depending on the model. Further details about package options, trim levels, and fuel economy ratings will be released closer to its production date. The new model is the first Jeep that will be built outside of the United States, at an assembly plant in Melfi, Italy. Its engines will come from plants in the United States, Brazil, and Italy. 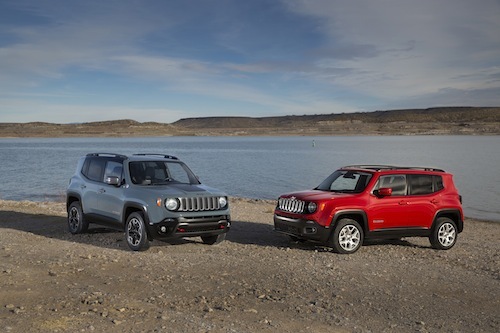 Jeep Renegade photos courtesy of Fiat Chrysler Automobiles, N.V.